Scroll down to see the top not-for-profit colleges and universities in Oregon offering online degree programs. Working professionals seeking an advanced degree in business or education have a large number of options available through the completely online programs offered by Concordia University. Business degrees available include digital marketing, business analytics, accounting, or business leadership. MBA students can specialize in eight different areas, including business intelligence, finance, marketing, risk management, and managing teams through change. Students interested in an education degree can choose from among three dozen master's programs and five doctorates. Many of Concordia's Master of Education programs are accredited by the National Council for the Accreditation of Teacher Education. The university also offers an online program leading to a Master of Arts in Digital Media and a master's in computer information systems. Some programs offer at least six start points during the year. Concordia offers a variety of scholarships for online students, including scholarships for military personnel and their spouses. There are also scholarships for students in the MBA, business leadership, computer science, or accounting programs. Lutheran educators and alumni of Lutheran colleges get a 20 percent tuition discount. Online students may also be eligible for free textbooks. Undergraduates have a choice of about 20 degrees they can earn through ECampus, the online education arm of Oregon State University. New options to the online undergraduate lineup include bachelor's degrees in business administration, history, Spanish, and sustainability. The sustainability program is a double-degree program that can be taken in tandem with any major. The college also offers an online post-baccalaureate computer science program specifically designed for students who previously earned a college degree in any field and wish to change their career. Students can take the entirely online program over as little as one year or as many as four years. ECampus also delivers graduate-level classes leading to degrees in fields such as business administration, education, counseling, industrial engineering, natural resources, fisheries and wildlife administration, and radiation health physics. Oregon State operates on the quarter system, so ECampus offers four terms per year. Undergrads taking at least six credits per term and graduate students taking at least five credits per term may be eligible for federal or state financial aid. Additionally, OSU offers a need-based ECampus grant to qualifying students. Online students may also apply for departmental scholarships. Chemeketa Community College says it has one of the most comprehensive online programs in Oregon, with up to 300 courses available online each term. Students who want to take their first two years of college coursework online can complete the Oregon transfer module and gain an Associate of Arts or Associate of Science degree. Chemeketa Online also has a wide range of career and technical-focused programs that can be completed entirely online. Students interested in an accounting career, for instance, can earn an Associate of Applied Science in Accounting or complete certificates in tax preparation, payroll, or accounting. Similar degree and certificate options are offered in fire protection technology, hospitality and tourism management, and business management. All online students at Eastern Oregon University are assigned an academic adviser who works one-on-one with the students to help them select the right classes and customize their degree. For maximum customization, EOU has an online bachelor's in integrative studies in which students pursue two or more minors rather than a major. Other online bachelor's programs include business administration, physical activity and health, and communication studies. Graduate students can complete an MBA or Master of Science in Education online. EOU has been honored by several organizations for its commitment to diversity and for being one of the top schools for producing Native American graduates. OIT has the following bachelor degree programs online: Applied Psychology (B.S. ), Health Informatics (B.S. ), Information Technology (B.S. ), Operations Management (B.S.) and Technology & Management (B.A.S.). Registered professionals can earn their bachelor's degree online through the following degree completion programs offered by OIC: Dental Hygiene, Diagnostic Medical Sonography, Echocardiography, Health Care Management, Radiologic Science, Respiratory Care and Vascular Technology. In addition, there is an online associate of applied science program (Sleep Health) as well as two online certificate programs (Clinical Sleep Health and Polysomnographic Technology). The university uses Blackboard as its learning management system to facilitate course instruction and expedite student-teacher interaction. Western Oregon University offers five online master's programs, although some of the degrees have residency requirements. The Master of Arts in Criminal Justice is a 45-credit program that students can complete entirely online in as little as four semesters of full-time attendance. The program is open to applicants with a bachelor's degree in criminal justice or social science. Applicants with a professional background in the field are preferred. Students may start the program at the beginning of any term. The Master of Arts in Interpreting Studies is open to professional sign and spoken language interpreters. Students begin the 18-month program in the summer with a two-week residency, then take online classes in the fall, winter, and spring. Students must attend another residency during their second summer in the program. Online programs in the field of education include a Master of Arts in Teaching, which leads to initial licensure, Master of Science in Education in Curriculum and Instruction, and a Master of Science in Education in Information Technology. Online endorsements include ESOL and reading, elementary math instructional leader specialization, and a certificate in instructional design. Northwest Christian University (NCU) offers a Master of Business Administration (MBA) degree that can be completed online in just 12 months. Courses are delivered asynchronously, giving students 24/7 access to course materials and class lectures. Online students also have access to the university's career services department for assistance in employment information and career counseling. There is a Master of Arts in Clinical Mental Health Counseling program that offers courses in a hybrid format. Students accepted to the program can expect to earn their MA degree in 28 months. Students are also given the chance to participate in the university's onsite counseling clinic where they can take advantage of opportunities for direct client contact. The Adult Learning Program at NCU is designed for working adults who wish to earn a baccalaureate degree without having to give up their full-time employment. Students can pursue Bachelor of Science (BS) degrees online in the following fields: accounting, business administration, criminal justice, interdisciplinary studies, psychology, and nursing. An online Bachelor of Arts in Interdisciplinary Studies is also available. Through the Prior Learning Assessment (PLA), it is possible for students to earn up to 30 credits that they can apply towards the degree program of their choice. Corban University's School of Professional Studies Online allows working adults to earn a bachelor's degree completely online. The program is open to any adults, whether they have any college credits to transfer or not. Corban awards some academic credit for prior training. Online classes are offered in eight-week sessions, and students can take from one and three courses each term, as fits their schedule. Classes are asynchronous so students can view classes at a time that is convenient to them. Corban offers online degrees in business and psychology. Business majors can choose to concentrate in accounting, leadership and management, or marketing. Psychology majors can choose to concentrate in family studies or in pre-counseling/clinical, a program designed for students who plan to pursue a master's in counseling, social work, or psychology. All of Corban's classes are designed to be applicable in everyday life and have a biblical perspective. Corban's online students who live in Oregon may be eligible for state financial aid programs such as the Oregon Opportunity Grant. All of Oregon’s universities — public and private — are independent, meaning you usually need to read through each school’s website to see your distance education options. But not today! 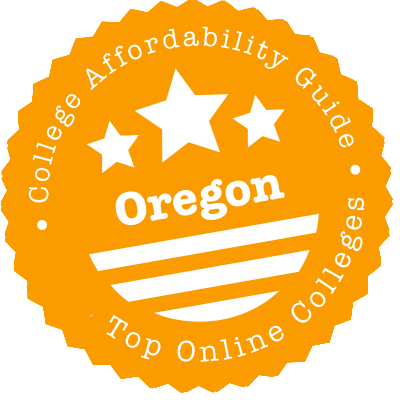 Our concise guide to choosing an online program in Oregon does all the heavy lifting for you. We’ll point you to affordable programs, give you the scoop on tuition and fees, and tell you which schools to think twice about enrolling in. Several Oregon two-year institutions, such as Portland Community College and Chemeketa Community College, offer transfer degrees entirely via distance learning to go alongside their other online associate degrees. While any associate degree is a valuable academic credential, a transfer degree is designed for students who want to get their general education credits out of the way before moving on to a baccalaureate program elsewhere. Community colleges charge less than universities, so a transfer degree may represent a cheaper way to reach your ultimate goal. If that’s what you choose to do, the state’s Higher Education Coordinating Commission maintains a webpage about transfers that contains links to the seven public universities’ transfer policies. The Oregon Alliance of Independent Colleges & Universities (OAICU) is composed of 12 private four-year institutions, some of which have established online courses and/or programs. The Alliance Cross-Registration Program lets students at any OAICU member school take one course per semester from a different member school, provided certain criteria are met. Oregon’s private colleges aren’t bursting with individual online courses, but several do provide them. George Fox University, which runs affordable online summer classes, is one. An admissions counselor at any OAICU member can inform you of how to take advantage of the program. Oregon Home Education Network publishes a list with links to online public charter schools. While some of the schools are exclusively for full-time distance learners, others allow you to take individual courses online while remaining enrolled in a state high school. Online coursework is especially advantageous for students enrolled in high schools with limited Advanced Placement (AP) classes. By registering in an online AP class, you’ll get high school credit. If you then score well on the subsequent exam, you’ll probably qualify for college credit as well, reducing the number of courses you need for graduation while lowering your future tuition. Students wanting to attend online colleges where nonresidents are charged high rates have a lifeline to cheaper tuition. Oregon is a member of the Western Interstate Commission for Higher Education (WICHE) and an active participant in WICHE’s Western Undergraduate Exchange (WUE), which means that state residents can attend participating colleges in 14 nearby WICHE states at a lower rate than other nonresidents. WICHE’s Western Regional Graduate Program (WRGP) does the same thing for graduate students, except it brings their tuition down to the same level as state residents enrolled at qualifying programs. It also works in reverse. Six Oregon institutions — Klamath Community College, Eastern Oregon University, Oregon Institute of Technology, Portland State University, Southern Oregon University and Western Oregon University — offer lower rates to WUE students (though not necessarily lower than the full-time distance learning rate). To be classed as an “Affordable Online School,” accredited colleges & universities must meet our stringent criteria for quality, flexibility and net price. Schools that make the cut have a CAG Score posted next to their profiles in our rankings. In 2018, no Oregon universities met our high standards. Most Oregon colleges and universities have attained regional accreditation while the state’s career colleges often achieve national accreditation. Others write off accreditation altogether. You’ll want to pay attention to your school’s accreditation status and take note of any recent problems it has had with its accreditor or government regulators. The Northwest Commission on Colleges and Universities (NWCCU) is Oregon’s regional accrediting body. Students enrolled at NWCCU-accredited schools are eligible for federal financial aid and have more opportunities to transfer credits elsewhere. NWCCU’s Directory of Oregon Institutions lists which colleges and universities it accredits. Check for any notes that say “warning,” “probation,” or “show-cause.” These represent the three negative actions, in order of severity, NWCCU may take against schools. Warnings are typically minor, but a probation or show-cause notice will come with a detailed explanation. If your school’s not in NWCCU’s directory, go to the Council for Higher Education Accreditation (CHEA) database. It includes both regionally and nationally accredited institutions, so all students at colleges on this list are eligible for federal financial aid (although those at the latter may have limited transfer opportunities). We’ve rounded up a few Oregon schools without accreditation. Attending one may cause other colleges and future employers to not recognize your degree. Higher Education Coordinating Commission but is not accredited by a CHEA-recognized agency. Therefore, it isn’t in the CHEA database or on College Scorecard. PBC, which offers online degrees in theology and church leadership, is not accredited by a CHEA-recognized agency. Therefore, it isn’t in the CHEA database or on College Scorecard. The Beloved Community offers certificates via distance learning, but it is not a state-recognized or accredited institution of higher learning — nor, to be fair, does it claim to be. Therefore, you won’t see it in the CHEA database or on College Scorecard. Northwest Commission on Colleges and Universities (NWCCU): This is Oregon’s regional accrediting body for colleges offering associate through doctoral degrees. Oregon Alliance of Independent Colleges & Universities (OAICU): Students at OAICU schools may take one class per semester from other OAICU schools, providing a side route to online coursework. Oregon Home Education Network (OHEN): OHEN will point you to the state’s free online high schools, some of which allow part-time enrollment. State of Oregon’s Higher Education Coordinating Commission (HECC): Find approved universities and programs in the Beaver State. Plus, learn which schools outside the state are authorized to accept Oregon students. Western Interstate Commission for Higher Education (WICHE): WICHE’s tuition reciprocity programs can lower the price tag of an undergraduate or graduate degree.